Colorado is home to a number of large lakes and reservoirs perfect for boating. All of the marinas on this list have both motorized and non-motorized watercrafts for rent. From runabout boats to pontoon boats, these boat rental places are sure to get you out on the water in style. Grand Lake, the state’s largest natural lake, is a popular boating destination that is near Rocky Mountain National Park. Therefore one of the most popular boat rental places near Grand Lake is Trail Ridge Marina. This marina offers pontoon boats, fishing boats and pleasure boats. Reservations are recommended at Trail Ridge Marina, and rentals are available for a minimum of 2.5 hours or a half day or full day. Expect fuel and life jackets to come with your rental agreement. Chatfield Marina provides boat rentals for those wanting to boat in Chatfield Reservoir at Chatfield State Park. Sixteen-foot fishing boats and pontoons are available to rent here. Since Chatfield Reservoir is located just outside of Denver, this body of water is a popular option for those wanting to escape city life. Boat rentals are for at least four hours minimum. For those wanting to boat the 880-acre Cherry Creek Reservoir at Cherry Creek State Park, the Marina at Cherry Creek is the option for boat rentals here. Pontoon boats and jet skis are available here, and reservations are highly recommended for this reservoir in southeast Denver. For those who don’t have power boating experience, take a tour on a 30-foot Sea Ray boat that comes with a licensed captain. Dillon Reservoir in Summit County is a hotspot for the boating community. Therefore there is no surprise that one of the best boat rental places in the state is near this 3,300-acre reservoir. Frisco Bay Marina provides fishing boats, pontoons and runabout boats. Fishing gear is available to rent for those seeking a fishing experience. Now for guests not interested in fishing boats, the runabout boats and pontoon boats drive similar to a car and do not require special knowledge to maneuver. If you find yourself in the beautiful town of Estes Park from May to October, head to Lake Estes for a great day out on the water. Lake Estes Marina provides boat rentals, from kayaks to pontoon boats. Pontoon boats come in two sizes, a seven-person pontoon boat and a 10-person pontoon boat. Horsetooth Reservoir is a well-known body of water in northern Colorado that draws a number of outdoor recreationists, from paddle boarders to boaters. Inlet Bay Marina is the marina to visit for all your rental needs at Horsetooth Reservoir. With a two-hour minimum, ski boats, pontoons, fishing boats and group boats can be rented from this marina. Boyd Lake Marina, located at Boyd Lake State Park, provides rental vessels for Boyd Lake guests. When it comes to boats, fishing boats and pontoon boats are available. The marina also carries live bait and other fishing necessities for those wanting to fish at Boyd Lake. 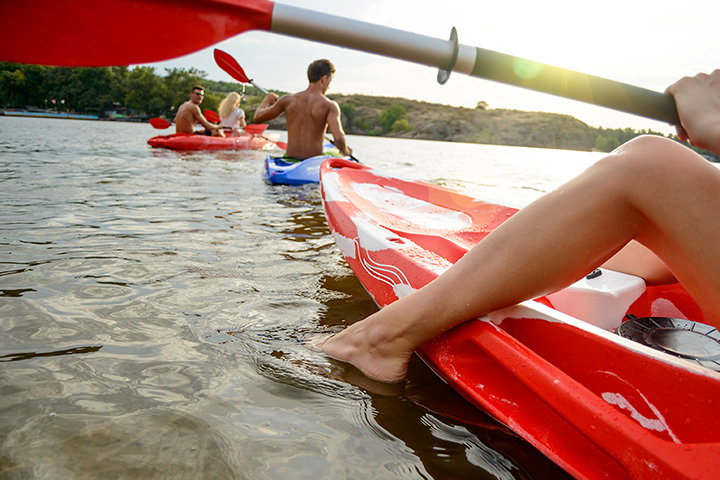 Lake Pueblo, a 4,500-acre lake with over 60 miles of shoreline, draws a number of water sports enthusiasts every summer. Also referred to as Pueblo Reservoir, this lake is located at Lake Pueblo State Park. There are actually two marinas within the state park, however the South Shore Marina is the most popular. This family-owned and operated marina offers pontoon boat rentals. Dillon Marina is the second Dillon Reservoir marina on this list. Since Dillon Reservoir, also called Lake Dillon, is a large lake oasis, there’s no surprise that two of its marinas made this list. Dillon Marina has boat rentals along with sailing classes and tours. Runabout boats, pontoon boats and sailboats are all available to rent at Dillon Marina. Five miles south of Grand Lake is the beautiful Lake Granby, which is the Centennial State’s second largest lake. For boat rentals on Lake Granby, head to Beacon Landing Marina. The pontoon boat rentals here vary in size to fit small groups of six to larger groups up to 12 people.